Stopping by a few comic book shops in Burbank, I found a flyer with a popular brand I never thought to find. 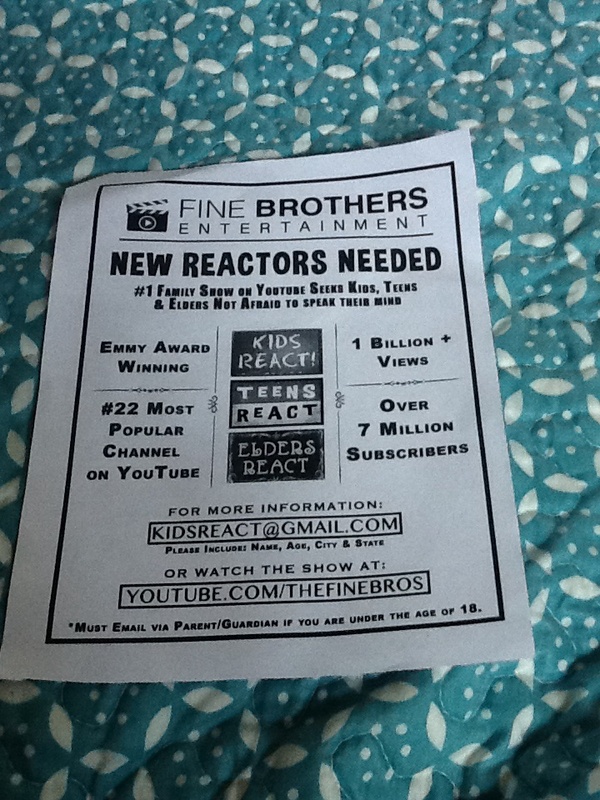 Fine Brothers Entertainment is casting! Casting for what, it doesn’t say, but from their impressive line of shows, I’m sure the reaction won’t be far from surprising. Beni and Rafi Fine are considered to be pioneers of online video. They mentioned that they have been filming all their life, and have made many moves to produce and gain recognition in the film industry. Traveling from the east coast to Los Angeles, California, the Fine Brothers have become YouTube’s priceless gem – collaborating in writing, directing and producing with other popular YouTubers such as Shane Dawson, ShayCarl, & KassemG, including their YouTubers React show with top channels such as Smosh and PewDiePie. So in other words, they’re big. But the question is, would you be interested to work with them? Check out the specs and details on this following link. The pay sounds good, the break time is reasonable, but there’s an old school Simpsons arcade game sitting in the same office with you, as you spend your time working as a P.A. They mention it’s untouched, and that it is now rare, and perhaps there would be no proper timing to even play this crazy relic. What a tease! But luckily, that’s not what the flyer was calling for. It’s calling for REACT cast members. It’s calling for talents. It’s giving newcomers a chance to join the Fine Brothers Productions. I mean, is that Simpson’s game really gonna stop anyone from becoming a star?